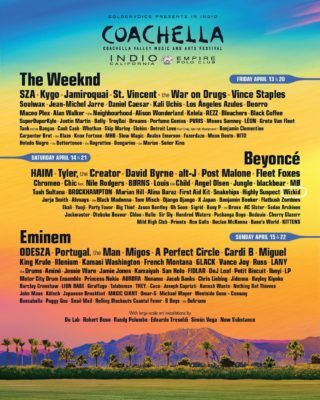 Nigerian Singer, Wizkid has been listed alongside other artistes around the world to perform at the 2018 Coachella Valley Music & Arts Festival in California, US. The International Concert which is set to be held between April 13 to April 22, 2018 is one of the largest, most famous and one of the most profitable music festivals in the Unites States and all over the world. In the past, the event had featured the likes of Lady Gaga, Kendrick Lamar, Future, Sia, Lorde among others. Meanwhile, the 2018 edition will feature Nigerian star, Wizkid alongside international acts like, Beyonce, The Weekend, Eminem and a host of others.